On Saturday 26th February we came and collected our Compass Magnum Classic caravan (having had warranty work done). I was very surprised to hear that the element had been changed in the fridge as it was tripping out. Strange because the work being carried out was for water ingress by the front windows. We would just like to thank you all for the fantastic service we have received, and for the workmanship. On inspection of the work we would like to say the job is superb!!! You would never know you have been there. Thank you once again we will definitely be recommending you to all our caravanning friends. Mr and Mrs G Snell. Your staff could not have been more professional, helpful or courteous. When you deal with the right people, who says you should only shop local? Nothing has been too much of a problem. Thanks again, you've created another dedicated customer! Thank you for your prompt after service care. 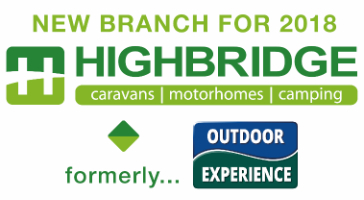 When the time comes for us to update our caravan we shall return to Highbridge Caravans. I am sure you would be pleased to know how delighted we are with the caravan and the service we received. How grateful I am for the help given to me by your friendly and efficient staff, not only on this occasion but also many times in the past. At all times we were treated with courtesy and respect. Please express our thanks and appreciation to your staff. I would like to take this opportunity to thank you and all the staff for you help and co-operation, all were courteous and helpful. I write to say how impressed my wife and I were with the service which we have received from your company.